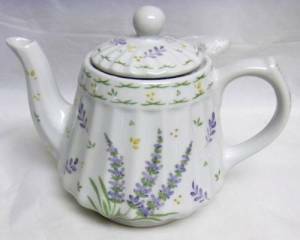 Purple lavender flowers and green leaves decorate this white four cup teapot. The teapot measures 6.5" tall and is both dishwasher and microwave safe. A fine mesh infuser is also included to make brewing loose leaf tea easy.